Why has contemporary radical political theory remained virtually silent about the stunning rise in inequality in the United States over the past thirty years? Schwartz contends that since the 1980s, most radical theorists shifted their focus away from interrogating social inequality to criticizing the liberal and radical tradition for being inattentive to the role of difference and identity within social life. This critique brought more awareness of the relative autonomy of gender, racial, and sexual oppression. But, as Schwartz argues, it also led many theorists to forget that if difference is institutionalized on a terrain of radical economic inequality, unjust inequalities in social and political power will inevitably persist. Schwartz cautions against a new radical theoretical orthodoxy: that "universal" norms such as equality and solidarity are inherently repressive and homogenizing, whereas particular norms and identities are truly emancipatory. Reducing inequality among Americans, as well as globally, will take a high level of social solidarity--a level far from today's fragmented politics. In focusing the left's attention on the need to reconstruct a governing model that speaks to the aspirations of the majority, Schwartz provocatively applies this vision to such real world political issues as welfare reform, race relations, childcare, and the democratic regulation of the global economy. "Joseph Schwartz is one of the leading progressive political theorists in the country. His recent book is a superb historical narrative and political analysis of both the undemocratic turn in American society and the anti-political turn in American academia. His radical democratic project avoids the pitfalls of a narrow politics of identity and an arrogant politics of old-style left solidarity-and it is powerful and propitious!" "In this excellent book, Joseph Schwartz provides what has been missing in recent political theory: a strong theoretical account of the causes of contemporary inequality and of the politics of citizenship and solidarity necessary to overcome it." "Joseph Schwartz offers a brilliant critique of the failures of contemporary political theory to address the urgent quandaries of our time. In the process, he points in a direction that would once again place the problems of inequality and class at the center of theoretical inquiry. A welcome intervention indeed!" 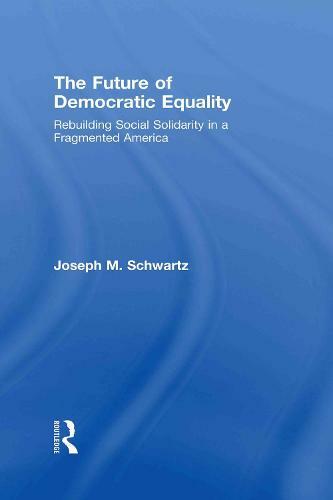 "The Future of Democratic Equality is an important book, and Schwartz succeeds in laying out a comprehensive and invigorating approach for challenging race-to-the-bottom forms of globalization. His book is both sharply argued and politically relevant, and attention to it is sure to benefit both the field of political science and the field of democratic politics itself."